Queue the Halo franchise - 5 Halo games in, a series of animations, cartoons and novels have followed. Some might argue that the Halo story is reaching or has reached its use by date. Whatever you think, the story is now being split in two directions - 343 Industries think they have a new story for Halo 4 and Greg Bear has been given the task of telling a prequel story but a prequel perhaps unlike any other in that it's set 100,000 years before the age in which most people know the Halo universe. 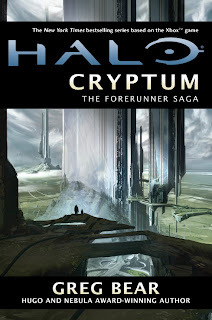 Halo Cryptum is the first of a trilogy known as The Forerunner Saga. Pitched as being "the first deep exploration into the time of the Forerunners, the creators and builders of the Halos. Almost nothing is known for sure about this ancient race. Worshipped by the Covenant as gods, their engineering relics pepper the galaxy, and their connection to humanity remains unanswered. " Well frankly, Cryptum raises more questions than it answers but that's OK as the plot gives a facinating glimpse into the origins of the Flood, an truly deep insight into the Forerunners and their struggles with what the presence of the Flood means for the 3 million planets that have sentient life. 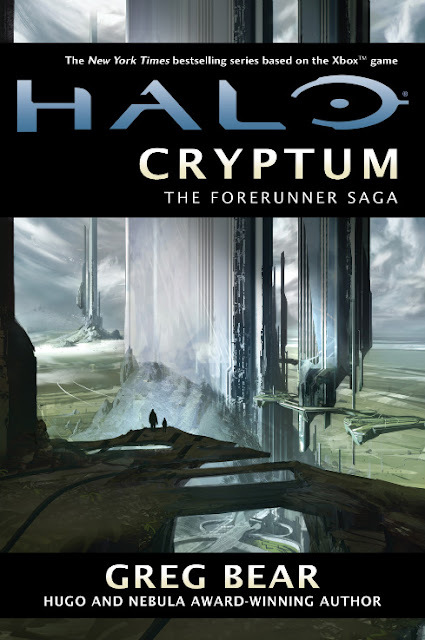 If you've seen Halo: Origins, that story puts Cryptum in context - this book is an exploration of the tales suggested in that story. He takes our antagonist 'Born Stellar' on a wonderful journey across the galaxy. Perhaps as a pawn of unseen masters, this 'manipular' interrupts the deep sleep of the Didact, a Forerunner whose knowledge of the universe could either save or perhaps destroy the galaxy. It's epic in concept but framed just right so that through the eyes of Born Stellar we see the ties of his family and the secrets within it gradually being revealed to show that the treasure he seeks is not the treasure he'll find. I think that above gripes can be ignored if you just want to get inside the Halo universe a bit more deeply that you might have otherwise tread by playing the games. It gives an extraordinary insight into why the Halo games are the way they are (albeit they were written first!). That said, if you've never even heard of Halo before, you should still be able to follow Born Stellar's ride quite well.